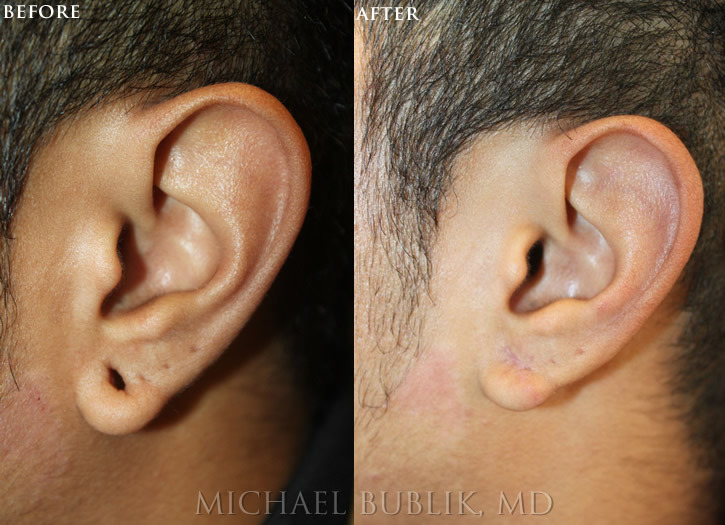 Dr. Bublik is well known for the aesthetic and painless repair of split or torn earlobes. The procedure is done in the office, under very local anesthesia, and with no discomfort to the patient. This condition is one of the most common aesthetic deformities of the ear and can result from heavy earrings, an earlobe that is pierced too low on the ear, or from trauma. Unfortunately, it can cause significant distress to the patient who wants to continue to wear earrings or would like to restore symmetry to their earlobes. Dr. Bublik's training and expertise provides a simple and effective procedure to fix earlobe tears and deformities in the office. In addition, Dr. Bublik will pierce the ear in a painless and sterile manner to reduce any chance of infection or swelling.